Dockers Size Chart and Fit Guide From the workweek to the weekend, you're a man of consummate class. 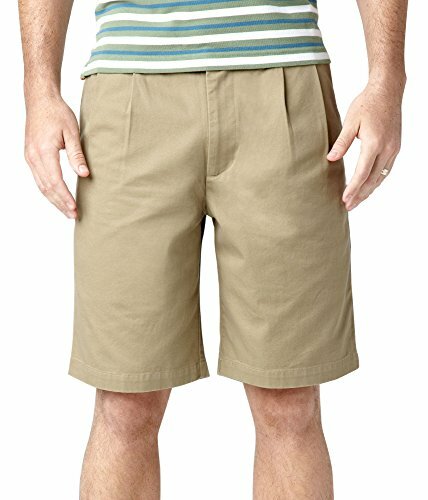 Bring composed style to your laid-back look with the Dockers® D3 Classic Fit Double Pleat Short. Dual-pleated front lends a classically styled finish. D3 Classic Fit sports a roomy fit through the seat and thigh. Sits naturally at the waist. Contrast Wings and Anchor stitched at back. Slash hand pockets. Welt and button-through back pockets. Welt coin pocket at waist. Belt loop waistband Zip fly and button closure. For those with larger frames, Big & Tall sizes are also available. 100% cotton. Machine wash cold, tumble dry medium. Imported. Measurements: Waist Measurement: 32 in Outseam: 20 in Inseam: 10 in Front Rise: 12 in Back Rise: 17 in Leg Opening: 22 in Product measurements were taken using size 32, inseam 10. Please note that measurements may vary by size. From the workweek to the weekend, you're a man of consummate class. Bring composed style to your laid-back look with the Dockers® D3 Classic Fit Double Pleat Short. Dual-pleated front lends a classically styled finish. D3 Classic Fit sports a roomy fit through the seat and thigh.